Having been gone for vacay, I knew I'd have a nice chunk of books waiting for me at the shop. What I did not expect was the stack I got. It was not small and definitely more than I expected for what I perceived to be a brief absence. Just looking at this week alone, there were more books than I remember seeing on the Diamond release list. I'm not complaining. Well maybe my bank account is, but whatever. Check out the haul below. I have a lot of nice books here. My final pre-order from a couple months ago came in and that Dynamite Entertainment's Nowhere Man by Marc Guggenheim and Jeevan Kang. Can't wait to check that out. Mostly Marvel of course, including several X-books and Carnage, U.S.A. 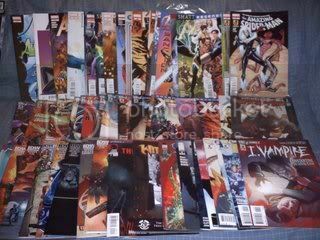 Some DC New 52. A few Image titles such as the amazing Shinku and The Activity. IDW's Ghostbusters and a few Yo Joe books. Lots of good reading ahead. I love it, I love it. Along with the trip to my lcs, I hit up Target to see what they had toy-wise. They were slacking towards the end of 2011 and it became hit or miss with them, well without the hit. But today I found some goodies. Target had for me some of the recent Marvel Universe comic packs. 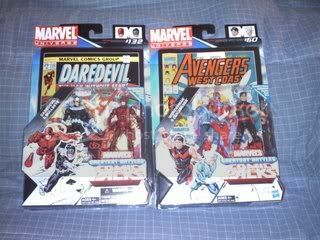 The Daredevil/Bullseye and Quicksilver/Wonder Man packs. I have been anticipating the DD/BE pack since I saw it at SDCC 2011. What I was not anticipating was Target's increase in prices. The singles are $8.99 and the comic packs are $17.99 now. I might not open these guys for hope of finding them at Wally World. I won't hold out for long though, as I do want to open these guys. Did you pick up any of these? What did you think of them? Like the toys? Let me know. Thanks for looking.